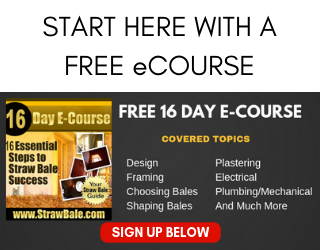 Plastering has a lot of challenges to it from mixing recipes to application techniques. Some challenges may not be obvious from the start, so be sure to spend some time learning what you need to know before you jump in. Today I spoke with a client who had spilled Natural Hydraulic Lime (NHL) all over their wood windows and trim while they were plastering. They asked how to deal with that as the lime had burned the wood and they could not remove the stains. If the lime had landed on the wood and was still wet a simple soapy water solution would work to remove the lime; however, this lime had dried in place and soapy water was doing nothing to ease the staining. So, a chemical reaction was necessary. For the lime, the agent in question is vinegar. A little vinegar on a sponge will remove most of the lime from the wood. It is often necessary to use a scraper to remove the excess lime and then the vinegar to clean up the wood. If the staining is deeper than the vinegar can handle, a light sanding may be required. So, always keep a little white vinegar on hand and a little patience to boot! The best practice is of course to seal your exposed wood before you start plastering and then to fully protect the wood with tape and plastic. 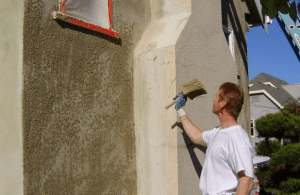 Even the best plasterers drop plaster as they work, so to expect anyone not to damage your woodwork when it’s left exposed is not a fair request. You’ll likely find that painters tape and masking tape don’t work all that well as once they get even slightly wet, they tend to start failing. I suggest you use plaster tape (for example: Shurtape Red Outdoor Duct Tape) as it is specifically designed for that use. You may not be able to find the tape at typical big box stores, but you can certainly find it online and at plaster supply yards. One big disadvantage of any tape, unless you can find something I’m not aware of, is that they all need to be removed within a certain time period. For example, the Shurtape can stay on for up to 14 days but then needs to be removed so it doesn’t mar the surface and leave a glue residue. For more on plastering, check out our How-To Instructional video on Natural Hydraulic Lime Plaster. 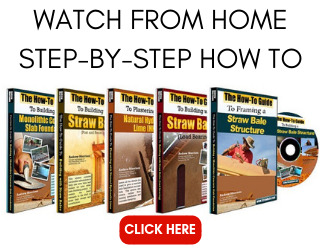 It will teach you everything you need to know to plaster your straw bale house from scratch coat to finish coat, including recipes and application techniques. 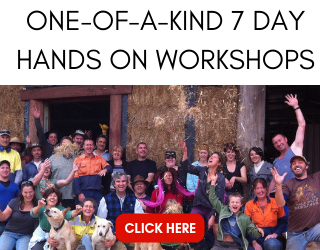 Have a strawbale house in progress, now baling is in slow progress in a partialy hidden wood structure. Partialy – the windows supporting wood beams and some other structuraly needed ones are uncovered, this beams will be covered only by metal mesh and then lime plaster … it is ok? or should I put some cover protection?